Maintaining good oral health is about more than simply correcting painful issues as they arise. In fact, it is quite the opposite. Early detection and prevention is essential in promoting healthy teeth. At Adult Dentistry of Ballantyne, we are proud to offer one of the most comprehensive dental exams patients will find anywhere. Dr. Robert Harrell’s thorough dental exams are designed to analyze the health of your entire mouth, including the teeth, gums, soft tissues and the temporomandibular joint (TMJ). Each of these considerations is essential in ensuring long-term oral health. The key to excellent oral health is early detection and prevention. As part of our comprehensive dental exam, the entire mouth, including the teeth, gums, soft tissues and the temporomandibular joint (TMJ), are checked. 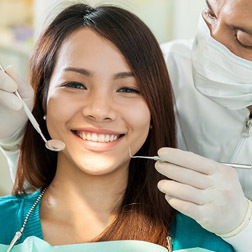 Adult Dentistry uses advanced diagnostic tools including digital X-rays, digital photography and laser cavity detection to reveal dental problems at their earliest stage. An examination by a dental professional like Dr. Robert Harrell is the best method of detecting oral cancer. Some problems that can be identified early in the mouth are indicators of larger medical problems, such as diabetes. A full set of digital X-rays is one of the first and most important tools in monitoring the health of your mouth. Dr. Harrell utilizes state-of-the-art digital technology for all dental X-rays. These computer-aided X-rays provide images of unmatched quality, making it easier to identify and diagnose oral health concerns. Combined with an oral cancer screening, digital dental X-rays can identify any issues in the supporting structures in the mouth. Furthermore, digital X-rays expose patients to far less radiation than traditional X-rays, making them a much safer option. While digital X-rays provide a clear picture of underlying tooth structures, digital dental photographs are designed to provide the patient with a clear visual aid of what is occurring in their mouth. Full sets of digital photographs make it easier for Dr. Harrell to show patients potential problems in the mouth and more clearly describe any treatments to be performed. The health of your gums is every bit as important as the health of your teeth. That is why all of Dr. Harrell’s dental exams include a thorough periodontal exam as well as charting. Periodontal charting consists of measuring the depth of gum pockets, the areas which form between teeth. Pocket depths are a distinctive indicator of gum health and are essential in monitoring for issues such as gingivitis. The temporomandibular joint (TMJ) is the joint that hinges the lower jaw to the skull. As many patients know, this joint is prone to causing pain due to several different factors. At your dental exam, Dr. Harrell can discuss any TMJ symptoms you may have and determine what treatment is best to relieve your discomfort. Similarly, a comprehensive bite analysis can determine if your teeth need adjusting in order to create a more comfortable bite and prevent unnecessary tooth wear. Perhaps the most important aspect of your dental exam is the inspection of each tooth for both existing and potential issues. These may include minor chips or cracks that you may not even be aware of but nonetheless have the potential to cause pain. Dr. Harrell also uses laser cavity detection to analyze the health of your enamel and determine if any of your teeth are at risk for developing cavities. By identifying cavities early, the teeth can be repaired before they start experiencing pain. In so doing, we can keep much more of the teeth’s original structure intact. At Adult Dentistry of Ballantyne, we believe that our dental exams are the first line of defense in keeping patients healthy and pain-free. In dentistry, it is imperative to detect problems early in order to maintain superior oral health. Even if your dental exam reveals the need for treatment, Dr. Harrell can provide a safe and effective treatment without sacrificing the natural appearance of your smile. Call or email Adult Dentistry of Ballantyne today to schedule a dental exam. If you are considering cosmetic work, contact us about a free, no-obligation smile consultation with Dr. Harrell. During your consultation, a complimentary digital smile preview (an $85 value) will be created to show how you will look when your treatment is complete. Perhaps the most important aspect of your dental exam is the inspection of each tooth for both present and potential issues. These may include minor chips or cracks that you may not even be aware of but have the potential to cause pain. Dr. Harrell also uses laser cavity detection to analyze the health of your enamel and determine if any of your teeth are at risk for developing cavities. By identifying cavities early, the teeth can be repaired before they start causing pain and keep much more of their original structure intact. At Adult Dentistry of Ballantyne, we believe that our dental exams are the first line of defense in keeping patients healthy and pain-free. In dentistry, it is imperative to detect problems early in order to maintain superior oral health. Even if your dental exam reveals the need for treatment, Dr. Harrell can provide a safe and effective treatment without sacrificing the natural appearance of your smile. Call or email Adult Dentistry of Ballantyne today to schedule a dental exam. If you are considering cosmetic work, contact us about a free, no-obligation smile consultation with Dr. Harrell. During your consultation a complimentary digital smile preview (an $85 value) will be created to show how you will look when your treatment is complete. Is your smile in trouble without you even knowing? Set an Early Detection Exam to find out.